As 2016 comes to a close and budget allocations wrap, many eyes have turned to project spending trends in the new year. The technology field is no different. While everyone tries to get a sense for what IT spending will look like in 2017, here are some recent trends and targets to keep in mind while allocating IT funds for your business. With economic uncertainty surrounding the first quarter of 2017, IT spending budgets are widely expected to be tightened to begin the year. Globally, IT spending is expected to be stagnant, while was a projected 5% domestic growth in IT for 2017 now looks optimistically to be closer to 2-2.5%. Even as CIO’s and business owners tighten their belts to begin the year, IT spending once again projects to be a major expenditure in 2017. With a projected $3.5 trillion in global tech spending next year, technology spending is still a massive industry. Hardware spending is projected to continue to tapper off in 2017 with a continued trend of fewer consumer dollars spent on devices, however, software spending is projected to see the biggest injection of spending in 2017 with a projected growth of 7% and approximately 16 billion dollars in new money. According to an October 2016 survey by TechRepublic, 49% of U.S. corporate respondents said that their IT spending would fall into the $100,000-$9.99MM range. With such a broad swath of tech money being allocated, here are some things to keep in mind when creating your 2017 IT budget. Cyber security remains a major point of emphasis for businesses in 2017. 69% of business leaders cited security as a top IT priority in the new year, with commonly as much as 1/3 of their annual IT budget dedicated to security. 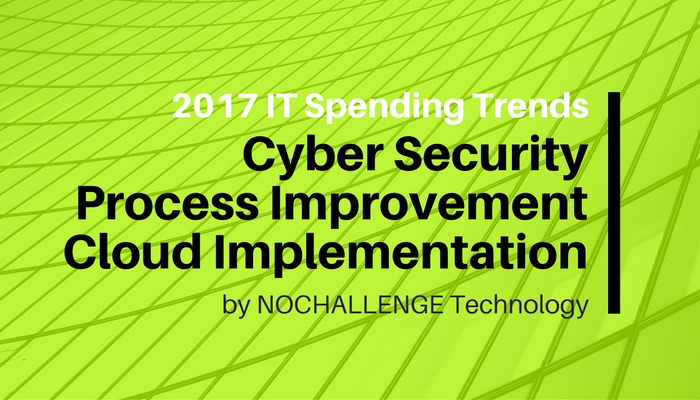 Other than security, improving business processes and efficiency is a top IT concern in 2017. Out of the box solutions are fine for some business users, but to obtain software that provides a solution unique to your business process, you need a technology partner that fully understands how you do business, and where your pain-points are specifically. See how NOCHALLENGE helped one large company do exactly that. Controlling costs and seeing a quicker ROI are the top reasons several smaller companies turn to technology solutions to run a tighter ship. Automating back office tasks and calculating risk are two major components to several of the custom solutions NOCHALLENGE has provided for clients in the past. Despite a potential slow start to 2017, IT spending is still expected to grow. Much of this is in response to many companies moving to the Cloud. See how our partnership with Oracle can assist you in moving your business to the Cloud. Despite some uncertainties to begin 2017 it remains clear that technology spending will remain a substantial portion of budget allocation, as well as a pivotal element in the growth and success of businesses of all sizes and industries. At NOCHALLENGE we look at custom software solutions as a chance better learn your industry and the challenges within it. Contact us today to let us help you with your IT needs in 2017.